It takes a remarkable force to keep nearly a million people quietly indoors for an entire day, home from work and school, from neighborhood errands and out-of-town travel. It takes a remarkable force to keep businesses closed and cars off the road, to keep playgrounds empty and porches unused across a densely populated place 125 square miles in size. This happened …not because armed officers went door-to-door, or imposed a curfew, or threatened martial law. All around the region, for 13 hours, people locked up their businesses and ‘sheltered in place’ out of a kind of collective will. The force that kept them there wasn’t external–there was virtually no active enforcement across the city of the governor’s plea that people stay indoors. Rather, the pressure was an internal one–expressed as concern, or helpfulness, or in some cases, fear–felt in thousands of individual homes. Four years ago, the city of Ferguson, Missouri, was locked down, with government officials deploying a massive SWAT team, an armoured personnel carrier, men in camouflage pointing heavy artillery at the crowd, smoke bombs and tear gas to quell citizen unrest over a police shooting of a young, unarmed black man. One year after white supremacists paraded through the streets, the face of downtown Charlottesville was transformed once again–this time with checkpoints, military-style camps for National Guard, and state police on every corner. When residents woke up Saturday, all entrances to the downtown mall were blocked off, apart from two checkpoints, where police looked through people’s bags for lighters, knives or any other weapons. Up above, standing atop a building site, two national guard members photographed the individuals coming in and out…A National Guard encampment was set up in McGuffey Park, between the children’s playground and the basketball court, where about 20 military police officers in camouflage were snoozing in the shade of some trees. A similar encampment was set up a few blocks away. Downtown Charlottesville felt like the green zone of a war-torn city Saturday. More than a thousand local and state police officers barricaded 10 blocks of the city’s popular pedestrian district, the Downtown Mall, to prepare for the one-year anniversary of the white supremacist rally last year that left dozens injured and one dead. To enter, people had to submit to bag checks and searches at one of two checkpoints…Preparations aside, unlike last year, no white supremacist groups had said they were going to visit the city, and, by week’s end, none had. Instead, it was a normal day on the mall except for the heavy security, a military helicopter constantly circling overhead, and hundreds of police officers milling around. They want us to be meek and submissive. They want us to report on each other. They want us to be grateful to the standing armies for their so-called protection. They want us to self-censor our speech, self-limit our movements and police ourselves. Americans are now so accustomed to seeing police officers decked in camouflage and Robocop-style costumes, riding in armored vehicles and carrying automatic weapons first introduced during the U.S. occupation of Baghdad, that it has become normalized…The dangers of domestic militarization are both numerous and manifest. 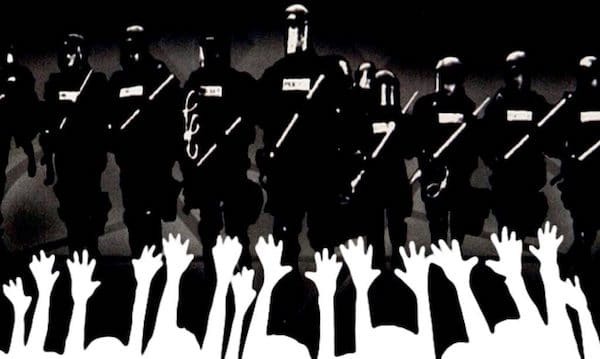 To begin with…it degrades the mentality of police forces in virtually every negative way and subjects their targeted communities to rampant brutality and unaccountable abuse…Police militarization also poses grave and direct dangers to basic political liberties, including rights of free speech, press and assembly. Militarized police. Riot squads. Camouflage gear. Black uniforms. Armoured vehicles. Mass arrests. Pepper spray. Tear gas. Batons. Strip searches. Surveillance cameras. Kevlar vests. Drones. Lethal weapons. Less-than-lethal weapons unleashed with deadly force. Rubber bullets. Water cannons. Stun grenades. Arrests of journalists. Crowd control tactics. Intimidation tactics. Brutality. It doesn’t really matter whether it’s a Democrat or a Republican at the helm, because the bureaucratic mindset on both sides of the aisle now seems to embody the same philosophy of authoritarian government. Remember, a police state does not come about overnight. It starts small, perhaps with a revenue-generating red light camera at an intersection. Constitutional attorney and author John W. Whitehead is founder and president of The Rutherford Institute. His new book Battlefield America: The War on the American People (SelectBooks, 2015) is available online.